Looking back on this year of 2018, we have had the privilege of engaging with people from all over the world who have visited our college from both foreign and local universities. This included visits by student groups with their faculty from five different continents – Asia, Africa, Australia, America and the Europe. These groups come to South Africa and the college for different reasons, leaving us, and them, changed, hopefully for the better. For our non-South African readers, a ‘tekkie’ is a soft running or tennis shoe used for many purposes and when we use the phrase ‘when or where the tekkie hits the tar’ it means ‘in actuality’. It has to do with where and when things happen. It has to do with making things happen; bringing what at one stage were only thoughts and dreams to a point where they become something tangible that touches and impacts people and changes how one views life. This is what I believe we accomplished this year in many situations as a college, where the takkies hit the tar, helping us deliver on our mission to train beyond boundaries. Here is an outline of what these universities and other institution come to do at the College. Michigan State University, Michigan, USA . The Michigan Spartans visited us with Prof. Jim Schneider and Dr. David Williams during August with ten enthusiastic students that participated in a programme we tailored for them called “Cash, Crime, Conflicts and Conservation”. 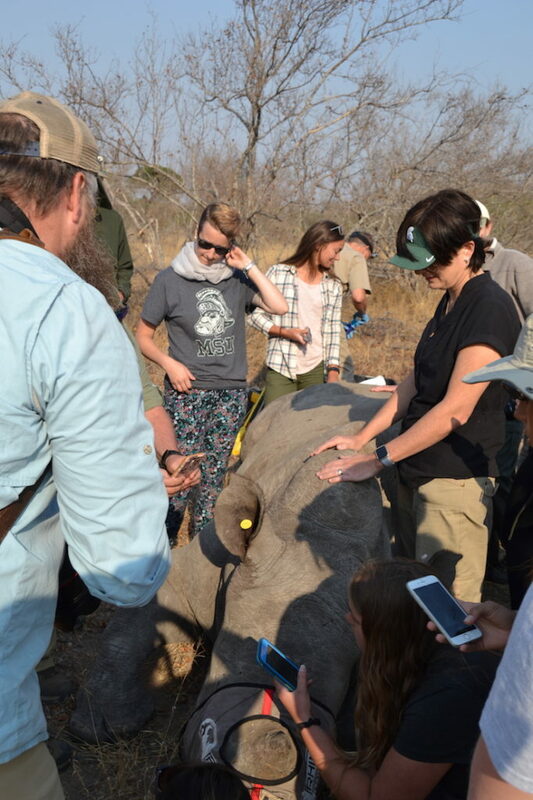 It’s a programme that is loaded with encounters with people in the industry that are actively contributing the efforts toward rhino and elephant conservation. 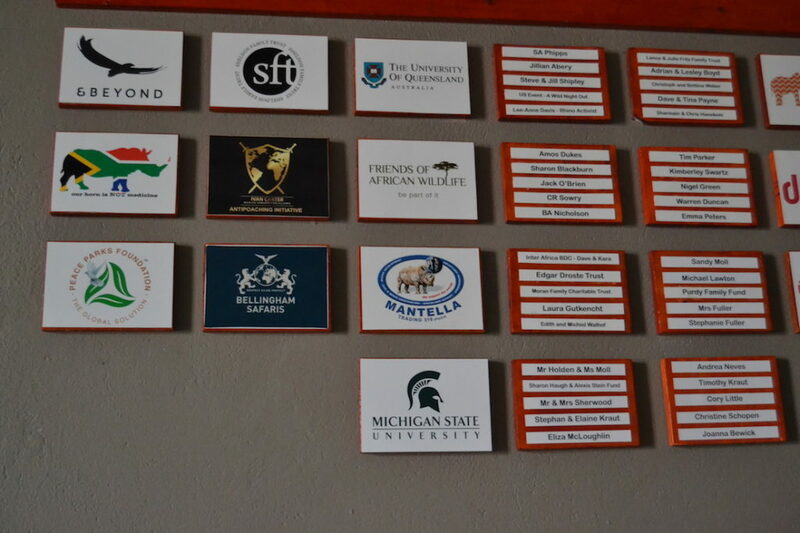 Although Michigan State University has visited our college for years, it’s only during these last two years that the programme launched into a different direction actually looking at the dynamics of the conservation dilemma around poaching and counter poaching efforts and tapping into our Skilled Practitioner Classes. Sierra Nevada College, Nevada.This community college has really supported the SAWC in data collection efforts, focussed on the impacts of elephants on marula trees since the year 2013. Every year Prof. Chuck Levitan would bring a small dedicated group from the business school to collect data on tree damage and present the data to our staff. The SAWC has been actively trying to gain data on the subject due to the fact that there are trees both within campus that are untouched and trees that are outside of our campus that do get visited by elephants. This pool of data is growing and we wish to thank Prof. Chuck Levitan for his, and his groups contributions over the years. Texas A&M University, Texas, USA. The Texas A&M University group come back year after year. Prof. Urs Kreuter that mostly leads this group knows South Africa very well. They move through the country starting in Cape Town in the Western Cape, and then travel to Northern KwaZulu Natal towards St Lucia whereafter they then travel through the Kruger National Park and the Lowveld region where we are located. The the last leg of their journey is to Northern Limpopo toward Mapungubwe. 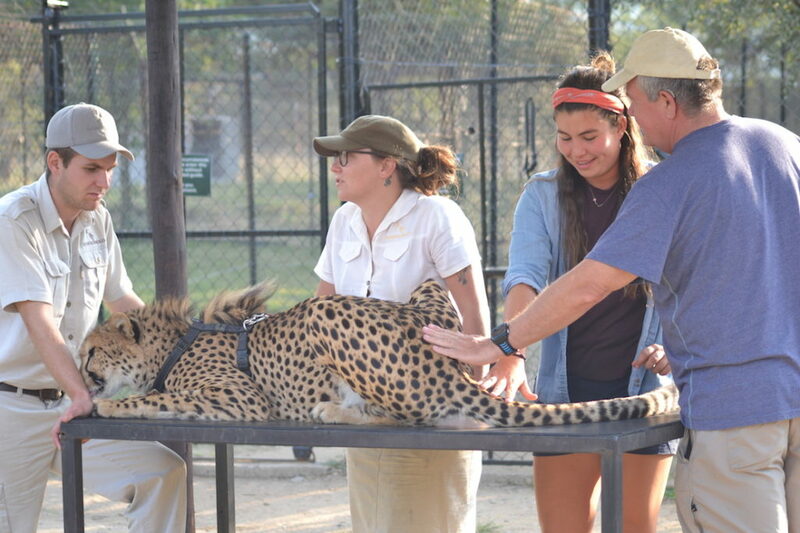 During their visit to the college they visit key places and people in the region which links to their yearly South Africa Biodiversity and Nature based Tourism Summer Itinerary. University of Florida, Gainesville, Florida, USA. During the month of May and June the University of Florida visited our region for the first time. They stayed at the College for nine days. Prof. Jane Southworth lead the group with Prof. Brian Child. The main focus of this itinerary was looking at different conservation management models and land uses with a strong community focus. They visited Kruger National Park in the south and central parts talking to various managers and stakeholders around the park within the Associated Private Nature Reserves (APNR). They also visited nearby communities bordering the Sabi Sands Game Park and had great contact sessions with key community members. 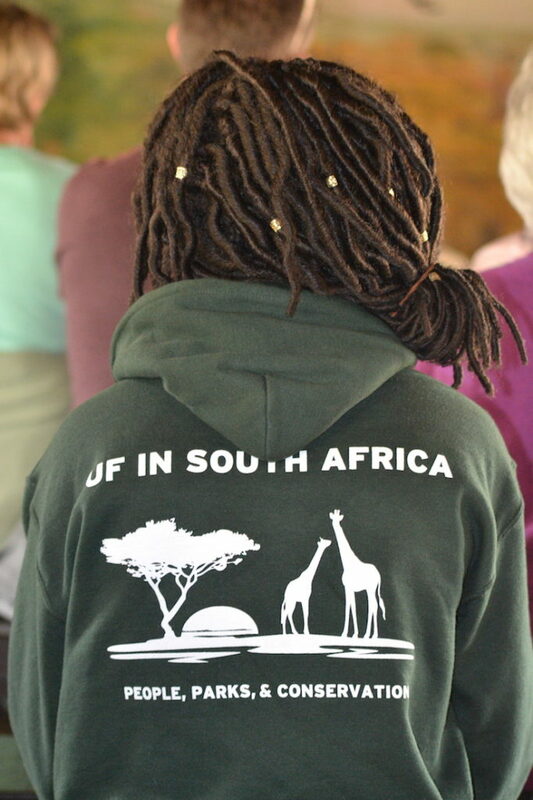 The University of Florida visits Moholoholo Rehabilitation Centre. University of Leiden, Netherlands, UK . The University of Leiden also visited our region for the first time this year in January.. This programme had great cultural dynamics and most students that came on the trip recommend it as one of the best experiences they have had in their lifetime. In an earlier Bateleur article this year titled SAWC’s Skills Practitioner Master Classes now fully fledged and growing… we quoted Prof. Maarten Schraama saying that ‘the large group of students on the course came from a highly international background, including the Netherlands, South Africa, Zimbabwe, Serbia and Italy. For more information on this program read our article HERE. University of Mpumalanga, Nelspruit, SA. This year The college and the University of Mpumalanga signed a Memorandum of Understanding between institutions which lead to their students coming to the college for some portions of their practical exposure. The second year group came in the month of May with 29 students and the first year group came during the month of September with over 80 students.A full article can be read HERE. Building their programme on our Skilled Practitioner Classes for practical exposure and collaboration with our Applied Learning Department for field work activities to teach the basics of collecting meaningful data correctly was a highlight. The fact that local universities collaborate with the college in such a manner is a step forward for our entire region and we hope that the students that participated in this initiative gained valuable conservation insight that they can use in their careers. Michigan State University – University of Queensland honored for donations toward our BatHawk project. University of Queensland, Australia. Since the year 2000 the University of Queensland have visited South Africa every year. They have a three to four week programme arriving in Johannesburg and travelling through to the lowveld where they stay at the college for a week to ten days before travelling further through Limpopo toward Mapungubwe, visiting various places of interest in the region. These include many endangered species projects that endeavour to rehabilitate and if possible release the species again, where the students learn about the region’s capacity to conserve its biodiversity. The group also visits the nearby communities every year, having a bit of fun along the way in a soccer challenge and visiting a village school engaging the local children. We always appreciate the groups that come from the University of Queensland for the way in which they relate to our South African communities, enjoy the cultural diversity and engage with conservation issues whilst learning about and enjoying the beauty of the South African bushveld. Behring Global Education Foundation, Shanghai, China. The Behring Global Education Foundation’s aim is to contribute to China’s environmental education. As part of this endeavour, the Kenneth E. Behring National History Day Contest happens yearly in which youth can participate and win a trip to South Africa. This year the foundation sent a second group from China that participated in an environmental education experience at the college. The group comprised youth that came with their guardians (parents and teachers). They visited our counter poaching dog unit, had a talk on the conservation of endangered species, had hands-on exposure to snakes, spiders and other critters from the nearby reptile centre; learning about the importance of conservation of the great and the small. They also went to Kruger National Park on a day safari to visit the Letaba Elephant Hall. It was a pleasure meeting these youngsters with their guardians especially since they really wanted to learn about our African conservation efforts. So, reflecting back on this year with so many faces that come to mind, so many memories of conversations had, and so many interesting stories to regale, we are indeed privileged to have had another wonderful year. Thank you to all those that have come all the way to our region to experience what we have to offer.